If a vote were taken by the sages of science on the most momentous and significant year in the history of scientific theory 1905 would have to rate either at or near the top. 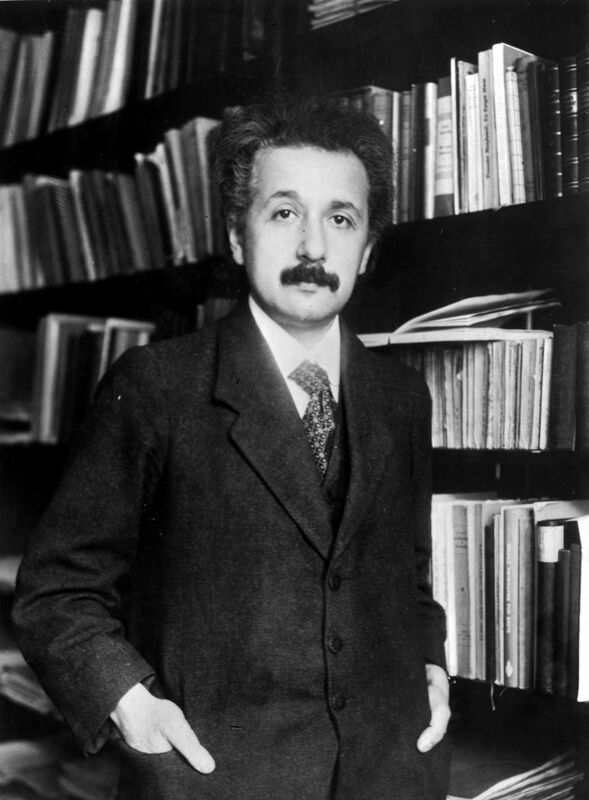 1905 has been dubbed “The Miracle Year” by the great minds of science for in 1905 an obscure student and patent clerk in Switzerland named Albert Einstein wrote four remarkable papers one of which was called “The Theory of Special Relativity”. 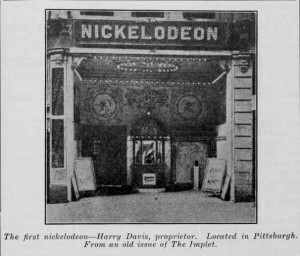 Ironically the “movie palaces” are now being replaced by smaller and smaller venues as Netflix, Amazon, Hulu and the like shrink the crowds going to the movies. We are moving rapidly backwards to 96 seats and a projector. Tsar Nicholas the Second of Russia was not an enlightened ruler and was unable to understand how quickly the world was changing in 1905. As a result his reign was marked by continual crises and revolts of peasants and urban workers. 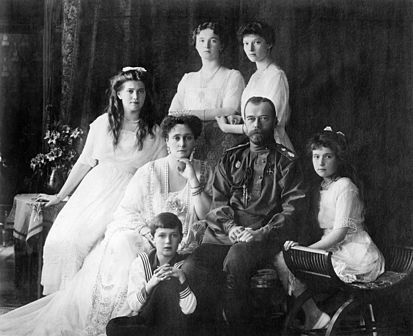 Those of 1905 marked the beginning of the end for Tsarist rule in Russia. 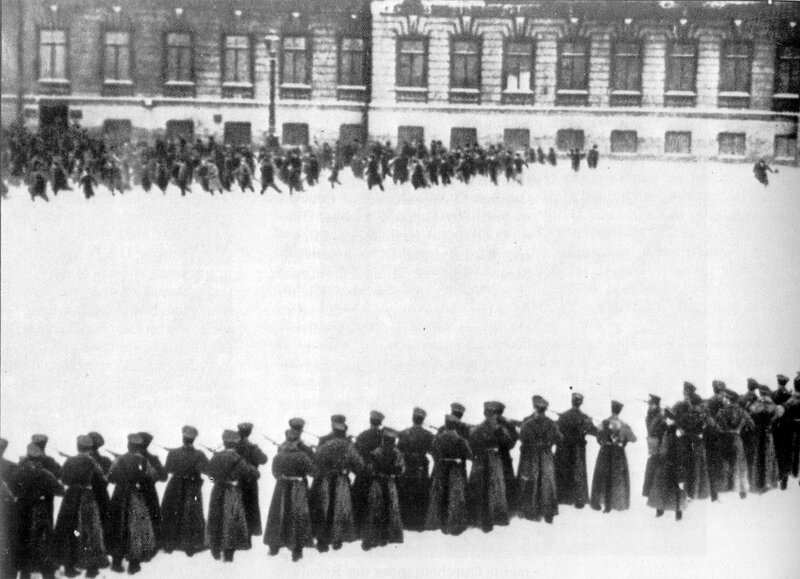 Above workers march on the Winter Palace of the Tsar in St Petersburg in 1905 under the watchful eye of Russia soldiers with bayonets fixed. 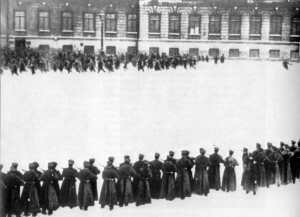 Soon after the photo was taken the soldiers fired on the crowd killing and wounding hundreds on a day known in Russian history as “Bloody Sunday”. As a result of the slaughter the revolutionaries gained even more adherents. Nicholas was faring just as badly overseas in 1905. His war with Japan over territories in the east was going badly and Nicholas unwisely decided to send the Russia fleet halfway around the world to Japan to teach the upstart and, to his European mind, racially and militarily inferior Japanese a lesson they would not soon forget. The fleet had just arrived in the waters off Japan when it encountered the Japanese navy under Admiral Togo Heihachiro. In two days the Russina Fleet was effectively destroyed by the Japanese at the Battle of Tsushima Straits. Russia lost 11 battleships, 4 cruisers and 6 destroyers to Japanese losses of 3 torpedo boats.Russia was forced to sue for peace. 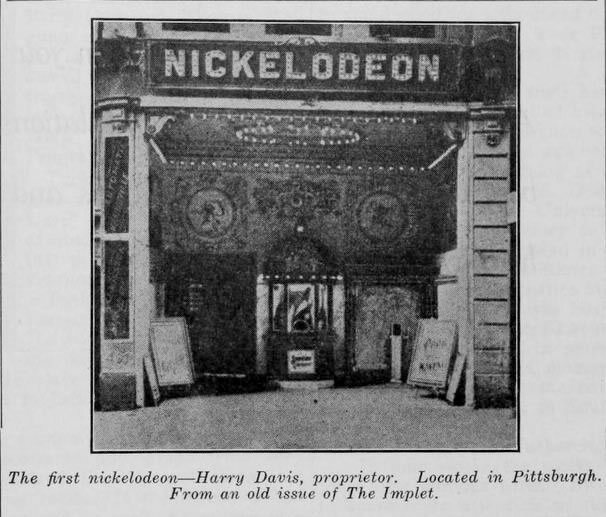 1905 also marked the debut of the silent movies in Calais, the first being shown in the summer of 1905 at the Opera House on Main Street- the former JD Thomas office building and, if rumors are correct, soon to be a brew pub. Through brutal repression the Tsar survived until 1917 when he was overthrown and he and his entire family subsequently executed by the Bolsheviks. 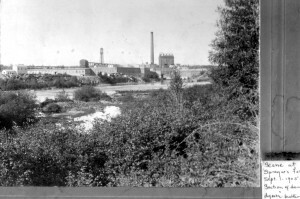 The biggest news in the St Croix Valley in 1905 was the construction of the Woodland Mill in Baileyville. Built almost entirely by Italian immigrants, the work began in 1905 with construction of the dam at the Falls. This did not please everyone. One of the few residents who lived near the dam site at the time was nostalgic about the Falls and remarked “ The famous waterfall know for many years as Sprague’s Falls was left to rumble and splash into the sunlight until 1905 when the St Croix Paper Company called a halt and the once beautiful cataract that had been admired for many years has passed on” This is not to imply there was opposition to the project, everyone was excited about the prospect of the “largest paper mill in Eastern Maine” rising from the wilderness. The mill itself soon followed as can be seen from the photo above. The transformation of the area around the mill and the mill itself was the source of much curiosity and wonder by the locals in the StCroix Valley. 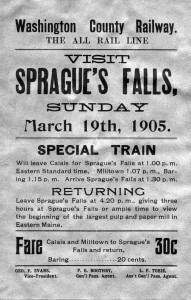 For 30 cents from Calais, 20 cents from Baring the Washington Country Railroad would take you to Sprague’s Falls for the day to view site of the construction. 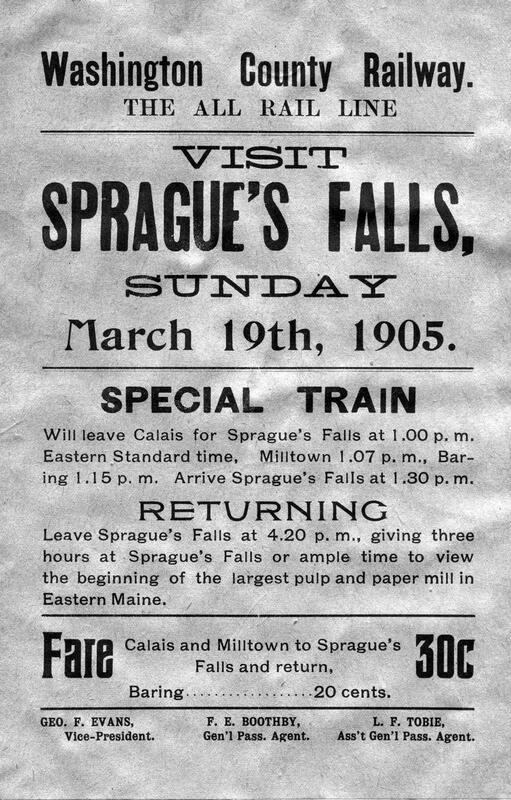 There were few amenities at Sprague’s Falls in those early days such as toilets or restaurants and although travelers had to come prepared to rough it for the day we’re sure the trains were filled by the time they left Baring. 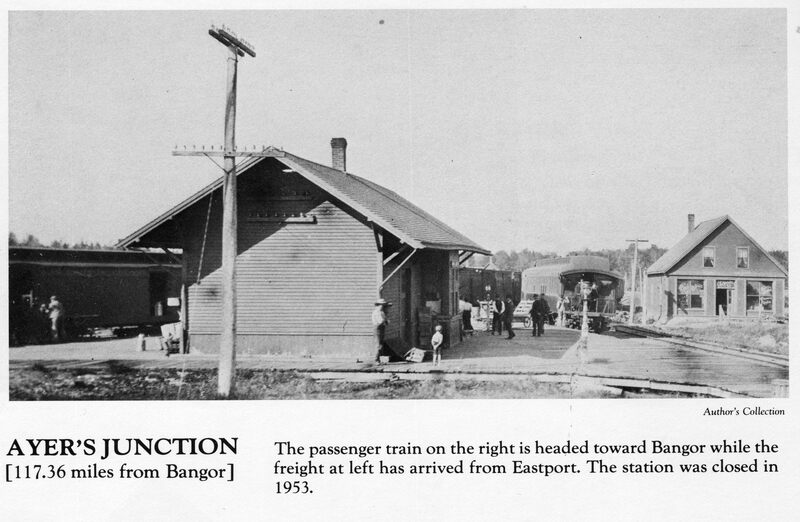 Note the trains were going to Sprague’s Falls, not Woodland. 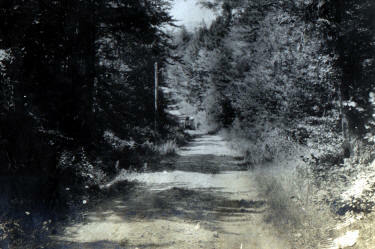 In late 1905 the postal authorities announced that mail going to Sprague’s Falls should be addressed to “Woodlands”, later shortened to ‘Woodland”. The automobile was just making its debut in Calais in 1905 but it wouldn’t become a practical mode of transportation for many years. The primary reason was the roads- they were simply awful. In truth the photo of Baring Street from the corner of Main Street in Milltown looking toward what is now the traffic circle of the new bridge looks pretty good. It had just been built by the State and would not have stayed in this relatively pristine condition very long. Even if it had it would have taken a traveler only as far a Maguerrewock where the road was almost always washed out and bridge unsafe. This photo shows the Airline in Alexander at Breakneck Hill in 1905. It more accurately represent the roads in 1905, narrow, rutted with trees and bushes encroaching on the roadway- more like a camp road of today. The Airline was improved over the years but not fully paved until 1962. 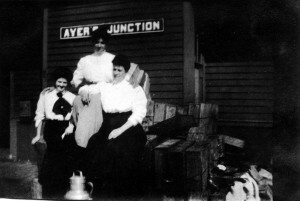 In this 1905 photo from Emma Boardman of Calais is boarding the train at Ayers Junction Charlotte with two friends on her way to Boston. 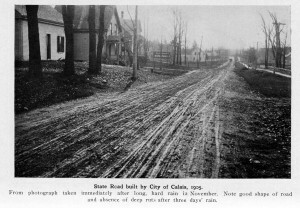 Calais was only directly connected with the rest of Maine by rail in 1899 but Calais folks took full advantage of the opportunity, once offered, to travel. 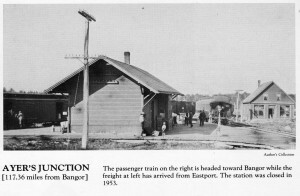 Ayers Junction was a major station in those days as the lines from Calais and Eastport met at Ayers and then proceeded to Machias, Ellsworth and Bangor.. In other local news of 1905 the Advertiser reports from Robbinston that on July 7th “ The arrival of the herring in the bay has transformed this sleepy little village into a hullabaloo of noise and reaction. The streets which were deserted at night are now crowded with smiling girls and youthful idols singing merry songs and with their utter joyousness making the calm air ring with their merry peals of laughter. Intermixed are also those who not finding the desired nutriment on “Uncle Sam’s” soil cross over the bay and return with some of the liquid of “John Bull’s territory. It was surely a port of excitement.” The Advertiser could have said this in fewer words by simply saying the entire town was celebrating the arrival of the herring by drinking enormous quantities of illegal booze smuggled across the bay from St Andrews. The Advertiser also reports that the Canadians of 1905 were easily as welcoming of those less fortunate as they are today. A Mr. Lynch arrived in St Stephen with 11 orphans from Boston. After addressing a church congregation on behalf of the children all 11 were taken in by local families. Life on the sea remained dangerous- the schooner Lizzie Carr out of Calais went ashore at Rye Beach New York and was wrecked. One crewman was lost and several saved but seriously injured. Finally we find an article in the Advertiser that druggists were now required to list on their bottles the amount of alcohol and drugs contained in their concoctions. In those days druggists prepared and mixed the medicine on the spot and the “medicine” commonly contained enough alcohol and opiates to cure anything, at least until the drug induced high wore off when the customer would naturally need more or be sick. 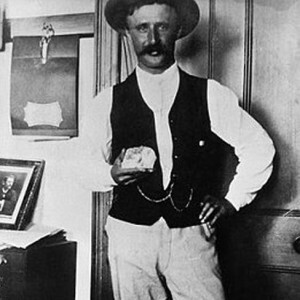 Addiction was common in the United States in 1905 fueled as it is today by the over prescription of drugs.